Part 1 of this tutorial series covers basic information about five different market sectors creating possibilities for investment and trading diversification for each student. Part 2 of this tutorial series provides basic information on generic components of an indicator & charting package and an overview of the complexity of technical analysis involved in discretionary trading. This information is then compared to a proprietary indicator & charting package where the technical analysis has been done by experienced technical analysis developers to simplify and clarify trading decisions without information overload. 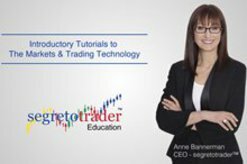 This tutorial series provides students with basic information to enable them to make educated choices about the markets that they wish to invest or trade in. In addition to this, it assists students to better understand the complexities of using an indicator & charting package and how to avoid multicollinearity and analysis paralysis, which many traders experience during their careers. After the completion of the tutorial series, students may conduct further research into the market sectors of interest to them and even undertake a subscription to the proprietary indicator & charting package to experience the clean and uncluttered work space provided by this package to ease into and out of trades in the different market sectors discussed during Part 1 of the series. We've been developing trading technology for the derivatives markets since 1997 and specialize in technical analysis and quantitative and qualitative analysis. Our trading technology is used by retail and institutional investors and traders. Important Note: The Proprietary Indicator & Charting Package is not included as part of this Tutorial Series.